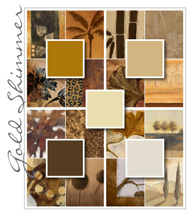 Gold Shimmer links together metallic gold and silver with warm yellow-based neutrals. Natural elements like gilded leaves, bark, and branches provide complex forms to the modern industrial metallic elements. Look also for traditional and nostalgic images or objects featured in gold and then presented in a clean modern space accented with warm neutrals. Animal skins, rustic logs, and leaves work beautifully to inject a global and ethnic feel. Gango Editions ColourSheen provides an excellent metallic base to images suited for the Gold Shimmer palette.